The following text was printed first in the Whitby Gazette and followed later in the RNLI Lifeboat journal in September 1919. Shortly after the commencement of the war, the finely equipped Red Cross hospital ship Rohilla, belonging to the British India Steam Navigation Co., whilst proceeding on an errand of mercy to France, went ashore at Saltwick Nab, about a mile to the south of Whitby, during the prevalence of a severe northerly gale on the 30th October, 1914. The facts of this tragic maritime disaster are known worldwide, eighty four out of a crew and staff of two hundred and twenty-nine being lost; but the following summary of the lifeboat services on that memorable occasion, may be recalled. On Friday, the 30th October, the Whitby No. 2 lifeboat, John Feilden, was hauled from the harbour under the Spa Ladder, and launched from the Scar, making two trips to the wreck, saving thirty-five lives, including the medical staff and nurses. On the second trip the lifeboat was badly damaged, and rendered unfit for further service, afterwards becoming totally wrecked. The Upgang lifeboat was then taken from its station, drawn through the town, and taken to Saltwick, from whence it was lowered down the face of the high cliffs to the Scar below. On Saturday, the 31st October. The Whitby No. 1 lifeboat, Robert and Mary Ellis, was launched from the beach, and strenuous efforts were made to row her to the vessel, but the endeavour had to be abandoned, owing to the tremendous sea which was running. The lifeboat was taken in tow by a steam trawler, and towed to within half-a-mile of the wreck, but at 9 A.M. it was found impossible to pass through the heavy seas, and she had to return to the harbour. 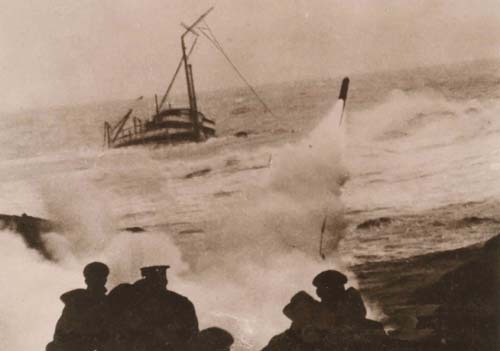 The Upgang lifeboat, William Riley, was launched, and heroic efforts were made to reach the Rohilla, but though on one occasion she came within hail of those on the wrecked ship, she was swept back by the seas, and the attempt had to be abandoned. The Scarborough lifeboat was towed to Saltwick, and several attempts were made to approach the wreck from the seaward side but this was found to be impossible. At 12.30 the lifeboat Robert and Mary Ellis was rowed from the harbour and along the beach, in search of a man who had washed past the piers on a raft, but the efforts were unsuccessful. 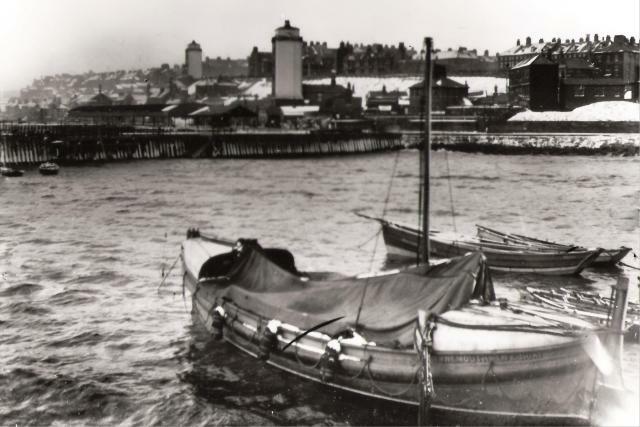 On Sunday, November 1st, the Tynemouth Motor lifeboat, Henry Vernon, was brought from the Tyne, in the darkness and in the teeth of the gale, and arrived at Whitby at 1.30 a.m. Oil was freely poured on the water, and under the guidance of Richard Eglon, a Whitby fisherman, at 8 a.m. the whole of the survivors then on the wreck, numbering fifty one, together with the ship's black cat, were landed safely, in one journey, in Whitby Harbour. The need of a Motor Lifeboat at Whitby was fully exemplified, and an appeal was made. A goodly sum of money was raised, and a generous bequest to the royal national lifeboat institution enabled the Society to place a splendid motor -driven Lifeboat at the port. 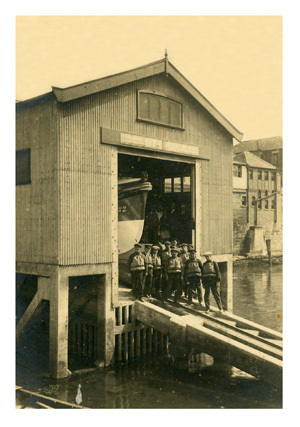 A new lifeboat house was constructed on the east side of the harbour, near the Market Hall, and the new life saving craft to carry seventy persons the construction of which had been delayed owing to the prior need for the building of vessels of war was dedicated, christened, and launched on Saturday afternoon, in the presence of a very large concourse of residents and visitors. A "flag day" was combined with the event; lady collectors with miniature lifeboat boxes appealed for contributions, and an interesting exhibition of Rohilla, bombardment, and other maritime and war like relics was held in the West Her lifeboat house in the morning. Sunny weather favoured the day's proceedings, but a cold north westerly wind prevailed. Messrs. T. Atkinson, J. Willis, A. L. Hume, M. Mothersdale, G. W. Theaker, H. and W. Pattison, 0. Bippon, T. Kirby, M. Bell, and J. Lorains. H.M. motor-launches, motor-fishing boats, and other craft in the harbour, were gaily deco-rated, and flags and bunting were displayed by many residents. Councilor T. H. Woodwork, J.P., Chairman of the Whitby Urban District Council, presided at the opening ceremony, and was supported on the improvised platform by Miss Marion Beckett, Miss Beatrice Beckett, Lady Diana Duncombe, the Rev. Chancellor Austen, Mr. J. Suggit (Chairman of the local lifeboat Committee), Mr. and Mrs. W. A. Headlam, Commander and Mrs. Hale, Mr. G. F. Shoe, M.A. (General Secretary of the Institution), and Mr. J. W. Foster (Hon. Local Secretary). There was a large attendance, principally of visitors. 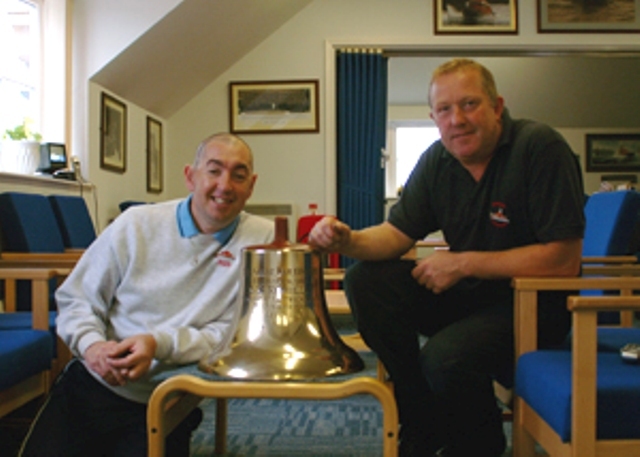 The Chairman's "table" consisted of the remains of the stern of the lifeboat which was badly damaged while returning after the second voyage to succour those on board the Rohilla, and on it was placed the ship's bell salved from the wreck of the Rohilla (seen left in 2008). The Chairman said their coming together that morning was the outcome of one of those great disasters which, on that north-east coast, unfortunately, from time to tune overtook and overwhelmed " the men who go down to the sea in ships." During the war the navigation lights on shore were extinguished, and the bell on the rock buoy was silenced, for fear of giving assistance to the enemy; and it was under those war conditions that, in the black darkness of the early morning of the 30th October, 1914, the splendidly manned and equipped hospital ship Rohilla came to her doom. After fittingly alluding to the heroic lifeboat services and other well-known circumstances associated with the terrible tragedy, he said the difficulty of battling against the fury of the elements in a boat propelled by oars clearly demonstrated the desirability of having a boat propelled by power, and such a boat had now been provided by the royal national life-boat institution, which had done so much to protect the lives of their sailors. Dr. Young, a local historian, wrote in 1814 that Whitby was supplied with a lifeboat provided by subscriptions eighteen years before that time, but that it was large and clumsy, and required too much time to launch and man. In 1840 a lifeboat was stationed on each side of the harbour; in 1841 one of them upset on the harbour bar, and four men were drowned. Down to 1860 the station was managed by an independent local committee, though the inspectors of the Royal National Lifeboat Institution paid visits from time to time. In 1861, during a violent storm, in which six vessels were driven on shore in one day, one of the Lifeboats was capsized, and twelve of the crew were drowned, only one man (Harry Freeman) being saved. Immediately after that great disaster, the Society offered to provide Whitby with a self-righting lifeboat, and that offer was accepted, and a branch of the Society was formed in Whitby. 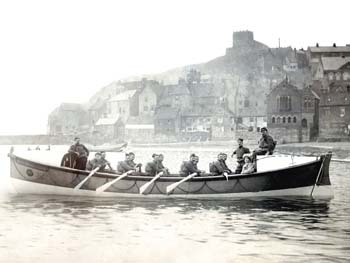 In 1864 a boat was also stationed at Upgang, and manned by a Whitby crew. In 1872 the last of the old boats, which had been the private property of Whitby, the Fisherman's Friend, was pat out of commission, and the Society sent a third boat to the port. In conclusion, he called upon Mr. Shoe to address the company. Mr. Shee referred in terms of praise to the conspicuous services and achievements of the local lifeboatmen, and said his duty was to introduce Miss Beckett, whose family had for generations taken the keenest interest in everything that affected the welfare of Yorkshire, and especially the North Riding. Mr. Beckett, as they knew, was the Member for the Scarborough and Whitby Division, and had been closely associated with Whitby by many acts of benevolence and generosity. He had seldom seen got together in a short space of time, in a little place like Whitby, an exhibition of such extraordinary interest and he congratulated those who initiated the exhibition and those who had contributed to make it a success. He wanted to mention particularly Mr. T. Atkinson, whose idea it was to have that exhibition and to thank most cordially Captain J. Willis and other master mariners and helpers who had worked so successfully for the exhibition. Running right through the gallant history of Whitby, like a golden thread, had been the splendid services of the lifeboatmen. Referring to the Chairman's "table," he said it was the happiest thought, whoever suggested it, that they should stand there at the stern of the lifeboat, for that poor fragment reminded them of the history and efforts of the Royal National Life-Boat Institution, and the gigantic work of mercy provided by the men who so courageously manned the lifeboats when their fellows were in distress. 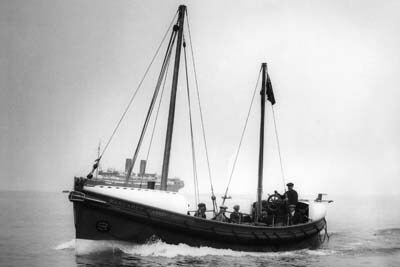 He added that they did not want the glorious and humane work of the Institution, which was supported solely by voluntary contributions, to be undertaken by Government or by some Controller of lifeboats but would prefer that the lifeboat Services should continue to be the free gift of a great maritime people. After dealing with the work accomplished, and the lives saved during the war by lifeboatman, he appealed to them to help the Institution to maintain a service which was the natural outcome of their maritime position and the humane and heroic corollary of sea power. Miss Beckett, who was received with applause, said that the exhibits were lent almost entirely by private people, wishful to help the Royal National Lifeboat Institution, which maintained a Service of lifeboatmen round the whole of our extensive coast. Whitby was always looked upon as a point of great danger to seafarers, and this fact was recognized by the Institution in that they permanently keep three lifeboats here. So far back as 1861 a lifeboat, manned with Whitby sailors, went out to save the crew of a sinking ship, but the Life boat was over turned by the heavy seas, and all the lifeboatmen were drowned except one. Yet, whenever the coxswain called for a crew, the men were always ready to run the risk to save the lives of their fellow seamen in distress. There are many relics of the Rohilla in this exhibition, and doubtless those who had under taken to explain the meaning of the exhibits to the public would tell the story of that tragic disaster. Her father was present, and he told her that it was the most ghastly sight, but that nothing could exceed the gallantry of the lifeboatmen. She also referred to the splendid work done by members of the St. John Ambulance Brigade, who worked day and night, often up to the waist in water, rescuing survivors who had jumped, or been washed, overboard. During the war Whitby was a favourite hunting ground for German submarines, and it became at one time almost a daily occurrence for crews, or what remained of them, to be landed in this harbour. Altogether, some eight hundred men were brought ashore, and aid given to them by that excellent Institution, the Shipwrecked Mariners Society. The lives of the Whitby people being so closely connected with these scenes of danger and adventure, it was natural that they had a very warm place in their hearts for the work of the Royal National Lifeboat Institution and they had organized this exhibition of relics in order to interest all in the objects of the Institution, to make a realistic appeal for financial support of one of the few remaining institutions carried on, on a gigantic scale, entirely by voluntary effort and contributions. (Applause.) She had always been keenly interested in anything to do with the sea, and was doubly so now, as before so very long she was going to marry a sailor. A beautiful bouquet of red roses was shyly presented to Miss Beckett by little Miss Molly Firth, the grandaughter of Captain J. Willis, and a hearty vote of thanks was also accorded her, on the proposition of Commander Hale, who said Whitby was one of the first Stations he visited as an Inspector of the Institution, and he was proud of the Whitby men. At three o'clock in the afternoon the ceremony of dedicating the new Life boat house, to the memory of Lieut. 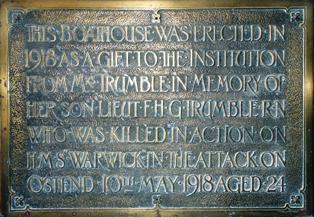 F H. G. Trumble, R.N., who was killed in action off Ostend, and who was a lover of and frequent visitor to Whitby. took place on the east side of the harbour, and was followed by the christening and launching of the new Motor lifeboat. Unfortunately, the late Lieut. Trumble's mother did not feel able to be present and witness the dedication of the house she had generously given to the Institution. But as one who had visited Whitby often with her boy and they both loved Whitby she asked him to convey to them her wish that the memory of her son should be kept green in Whitby. It was fitting that the gallant young officer's name should be linked with the noble services of the lifeboat, for which Whitby had been celebrated for generations past. The marvelous achievement by which the British Nary sealed the outlets at Zeebrugge and Ostend, from which the German submarines had been accustomed to emerge on their fell purpose of destruction, placed the final seal on the doom of the Germans, who were at that moment engaged in signing the Peace Treaty at Paris. That unique and splendid achievement rightly compared with Nelson's famous action at the Nile; it linked up with Jutland, the Battles of the Bight and the Falkland Islands, and placed Roger Keyes and his gallant band, and Beatty and Jellicoe, in proper relationship as true descend¬ants of Nelson and Collingwood, Blake, Drake, Frobisher, and their own Captain Cook. (Applause.) In dedicating that house to the memory of Lieut. Trumble, he also dedicated it to the people of Whitby, who had provided generations of seamen and lifeboatmen, and he appealed to them to protect it from injury and damage. By a set of circumstances not of their choice, and not altogether in accordance with the. best interests of the lifeboat Service, the house had been placed on that (the east) side of the harbour, rather out of sight, but it had the advantage of being placed amidst the very homes of the lifeboatmen. He urged them to look upon it as their very own, and to make it a point of honour to see that the house, which commemorated a noble death and sheltered an instrument of life saving, was protected from damage by mischievous hands. He said he felt he could not do better, in conclusion, than quote the words on the Scroll of Honour which His Majesty the King had directed to be given to the relatives of the men who had lost their lives in the war: " He whom this " house " commemorates was numbered among those who, at the call of King and Country, left all that was dear to them, endured hardship, faced danger, and finally passed out of sight of men by the path of duty and self-sacrifice, giving up their own lives that others might live in freedom. Let those who come after it see to it that his name be not forgotten." Mr. Shee, in an eloquent speech, referred extensively to the war and the great part taken in it by the maritime forces, which had ensured the freedom of the seas, a freedom broad-based upon the noblest traditions of chivalry and humanity, qualities fitly reflected in the lifeboat Service, which was founded for peace and war alike. He outlined the work of the lifeboat Service during the war, and said that during the war the Whitby boats were launched on service thirty one times, and saved one hundred and forty lives. For centuries Whitby had been so closely connected with the sea that it would not have been surprising had they instituted some ceremony like the Doge's marriage with the sea. No incident in the war reflected greater credit on the men and women, and even children, of Whitby than those connected with the wreck of the Rohilla. After recounting the story of the casualty, and commending the lifeboat Services, he publicly thanked Coxswains Langlands, Eglon, Robinson, Kelly, Smith, and Major Burton (Tynemouth), and their crews, and all who assisted. In handing over the boat to the local Committee, Mr. Shee said the Margaret Harker Smith, was a self-righting lifeboat, weighing nearly eleven tons; it would take forty men on her gunwale to bring her awash with her crew and gear in place, and sixty three men, in addition to the crew and gear, to bring her deck awash she was, in a word, the last expression of human ingenuity in lifeboat construction. On the 15th October, 1914, the Institution were notified that Miss Margaret Harker Smith had bequeathed £1,000 to the Institution, and on the 20th January, 1915, her Executors agreed to add £6,000 towards the cost of providing and endowing a Motor lifeboat for Whitby, the sum of £1,668 16s. 4d. being also raised locally by the appeal for funds after the wreck of the Rohilla. The cost of the boat and the endowment had, owing to the increased cost of materials, labour, etc., increased to £13,000, but through the generosity of the Trustees, the Institution had thus received a very large contribution towards endowing that splendid lifeboat in perpetuity, so that, as long as Whitby lasted which he hoped would be forever there would be a lifeboat bearing the name of "Margaret Harker Smith" at Whitby. In conclusion, the speaker said: "She adds to the strength, beauty, and seaworthy qualities of her predecessors the powerful help of her fine engine, which is able to drive her at eight knots per hour; but there is one thing in which I am glad to say there is no change. She will not have a better crew than the John Feilden, for she will have the same crew and the same Coxswain, and a better Coxswain and crew are not to be found on the coast of the United Kingdom. At a time when we are witnessing the termination of this long conflict, and facing the task of reconstruction before us, nothing could be more fitting than that we should have this ceremony today, and that our thoughts should be occupied with our association with the sea, and its significance for our island people. For the history of England is like some great symphony played by a mighty orchestra. And if we listen with attentive spirit we shall hear, amid the harmonies, now sad, now triumphant, now full of tears, now resonant with the shouts of victory, but always heroic, the rise and fall, the ebb and flow, the roar and surge, the deep diapason of the sea." (Loud applause) The Chairman, in accepting the boat on behalf of the local Committee, said the greatest care would be taken of her, and he was sure the craft and her crew would maintain the traditions of the past. "We thank the service for the provision' of this boat, and also for this boat house (as a memorial of a lover of Whitby who in the war made the supreme sacrifice for King and Country) and we beseech Thee to bless those who have given of their substance and their prayers for this benevolent work. May it please Thee also to bless and prosper the National lifeboat Institution and those who direct its operations. Accept these prayers and praises for the sake of Him Who once walked upon the waters of the Sea of Galilee in the midst of the storm, and said, 'Peace, be still,' even Jesus Christ our Saviour, Who now liveth and reigneth with the Father and the Holy Spirit, one God, world without end." All joined in repeating the Lord's Prayer, and the choir of the Mission to Seamen (stationed aboard one of H.M. motor-launches close by), in charge of Mr. I. Haslop (Reader), led the singing of the well known sailors' hymn, "Eternal Father, strong to save," in which the public joined with much fervour. then followed, Miss Jenkyn Brown, of Sheffield, naming the boat the Margaret Marker-Smith, and, after she had broken a bottle of wine against the bow, the boat glided into the water at four o'clock, to the accompaniment of lusty cheers by the spectators and the hooting of the sirens of H.M. motor-launches; the singing of a verse of the National Anthem terminating the proceedings. The boat, with several passengers, made a short trip down the harbour, and was then re-housed. was a Yorkshire lady. Her father, the late Mr. Edward Smith, was one of Sheffield's best known and most highly-esteemed manufacturers sixty or seventy years ago. He was a man of high culture, and a member of the Society of Friends, commonly called Quakers, and was often referred to as Quaker Smith. He took in an active part in the Anti Corn Law agitation, and was associated with Cobden and Bright in this national cause. A man of considerable means, a Liberal in politics, a total abstainer, a constant advocate and supporter of every movement for the better education and elevation of the people, he had the respect of the then rapidly increasing town of Sheffield. His daughter, Margaret, was deeply attached to her parents, and on the death of her mother devoted herself to her father. After his death, she added her mother's maiden name, "Harker," to her own, and became Margaret Harker-Smith. During the whole of her long life she devoted a considerable amount of her income to philanthropic objects; amongst others, she was always greatly interested in the welfare of our sailors and fishermen. Throughout the day great credit was due to a band of local ladies who, by the sale of flags, made a street collection, the receipts, including collections taken at the Coliseum and Empire Theatre, amounting to the gratifying sum of £98 17’s 3d. The admission money taken at the exhibition, including a donation of £25 from the British India Steam Navigation Company (the owners of the Rohilla), and £2 2s. from Mrs. Weddell, amounted to £77, making the day's gross proceeds £175 17’s. 3d.